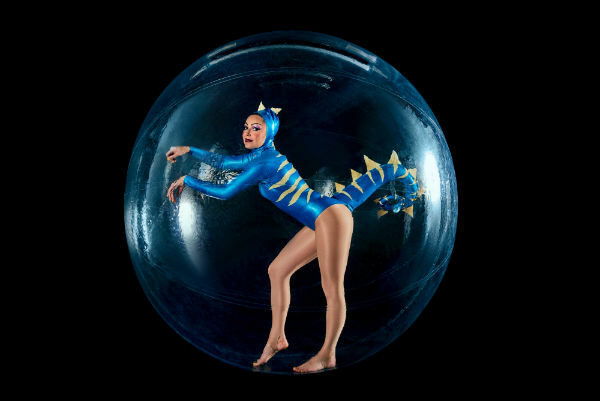 The sea creature’s rubber costumes are eye-catching with their bright colours and bespoke design, you will not find another act quite like it. Captivating for adults and children alike !! The sea creature’s bubbles can float on water and are a brilliant addition to your pool party. They can be stationed on land besides the docks, or even in the sand by the sea. You may also book the costumes without the bubbles if you feel that this would better suit your event. Enquire for other costumes and themes available inside the bubbles, including Xmas, Winter, Space and LED. Be the first to have these unique sea creatures at your event. Perfect for Sea, Beach, Summer and Underwater themes. The company behind this, Zero Central, has been funded by the Arts Council of England and supported by the Esme Fairbairn Foundation and National Centre for Circus Arts. Zero Central’s Artistic Director Stah ZCL has been the recipient of a Jerwood Circus Award. Zero Central performed at our European event and we were really impressed with the flexibility and professionalism of her performance. They were open to music and costume suggestions before the event, and designed their performances to suit with the needs of the audience. The aerial acrobat performance added to the delegate experience and judging by the number of photos and videos taken by the attendees they really enjoyed it!